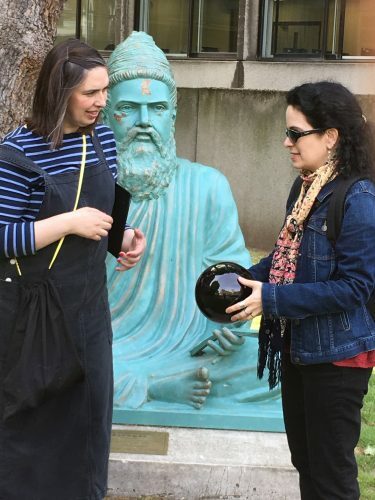 What tremendously thoughtful fun I had meandering round Birkbeck with a black mirror, gazing into a fairy ball! Sheila Ghelani had designed our route by placing one of the mirrors she’d created onto a map: we were going to meander around the black hole thus created. Decked out with palm-size pebbles of mirrors in black velvet pouches, we headed off into the unknown of John Dee and his magic 16th century angels. It didn’t feel that unknown to start with, since our first stop was only in the square opposite Birkbeck. But we were reflecting. Literally, in our mirrors, and also with lots of the thinking sort of reflection. I pondered and confected. And the unknown gradually came into – or maybe I should say, out of – focus. Our black mirrors held deceptively small-yet-enormous universes. You really can see something remarkably close to 360 degrees when you angle them correctly. We sketched the landscape like an artist: a 17th-century artist using a ‘Claude glass’ to produce something as eerily picturesque as a Claude Lorraine painting. We acted like tourists: 18th century tourists so horrified by the awesome crags of the Lake District that we could only view them in our black mirrors by turning our back on them. 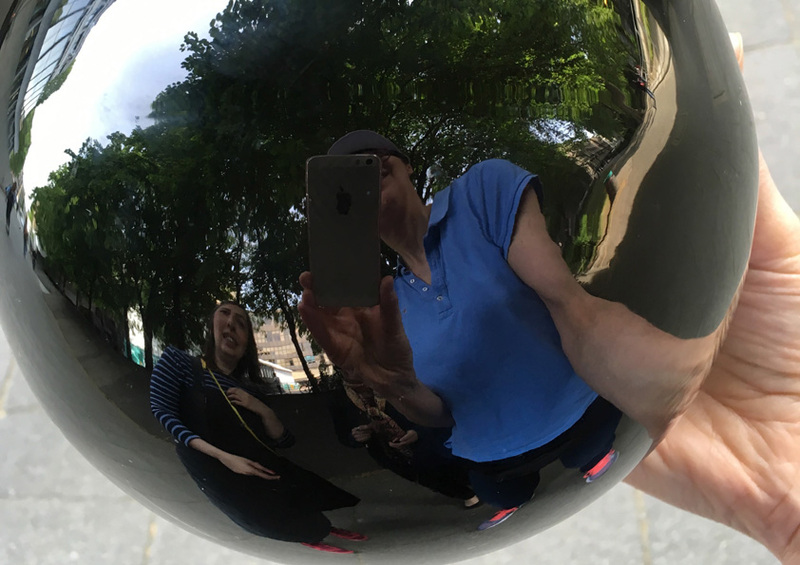 Then like more modern tourists, trying – and generally failing – to get the perfect selfie-shot in, and of, our Fairy Ball. The nigh-on-360 degree views were, we discovered, seductively slippery. How many times did I perfect my view, to lose it when I tried to sketch or photograph it! And how many times did I discard an impressive vision of pillars or a tree (both, we discovered, were splendid subjects) – in the quest for somehow more perfect perfection. ‘Authenticity’ has sometimes been badged as a holy grail for ‘creatives’. And we kept on looking at, and so creating, authentic black mirror views. So authentic that you really do have to be there to see them. We discussed materiality as another unpredictable and evasive construct. ‘Claude lenses’ and our own black mirrors are glass: sand miraculously made into liquid. The oldest constructed black mirrors were Aztec polished obsidian: volcanic glass that was used for divination and as a status symbol. Water is, of course, another ancient black mirror. So we looked out for, and thought about, the water we had overlooked: the drains and rivers trapped under the streets we were walking on. We noticed, too, how many modern black mirrors there are. Not just the mirrored sunglasses we had seen in Gordon Square, but all those blacked out cars and enigmatic urban windows. Of course, the ubiquitous mobile phones all have sleeping black mirror screens. We’re not that different from the Aztecs: our black mirrors, too, act as finely-graded status symbols and for 24/7 divination. We were so busy reflecting – in all senses – that we didnt get time to do any scrying. This is what it is called when you look intently into a black mirror – and not simply for reflection. Scrying has been thought to act as a portal to other planes of existence. But maybe we did well to miss that. John Dee, master mathematician and polymath, was convinced by his scrying partner, Edward Kelley, that the angels had informed him that God required them to swap wives. Fake facts are obviously not a new phenomenon! Nor is #metoo: Dee’s journal reports that the task was achieved ‘after initial protestations’ by his wife. It’s easy to point fingers at the inhabitants of the past-is-another-country. We were not (quite!) as ridiculous. Only a minority of the passers by actually stopped and stared as I processed down the pavement gazing regally into what must have looked something like a shiny black football. On reflection, though (ha! see what I’m doing here! ), the black mirror and the gazing ball raised fascinating questions about how and what we can and do see. The transitory nature of what could be seen is a great joy. I’m definitely going to keep on playing with the best souvenir present I ever got: my very own hand-crafted black mirror. Thanks. Sheila!